Reconstruction of Lucy’s skeleton. Source: Wikimedia Commons. Whenever the topic of human evolution comes up in a classroom you are bound to hear the name “Lucy” thrown around. But who exactly is Lucy and why is she so important? Well, tracing the roots of the human family tree is a tough task. Most ancient human skeletons discovered are only fragmentary, but when Lucy’s fossilized skeleton was discovered by Donald Johanson in 1974, it was 40% complete. 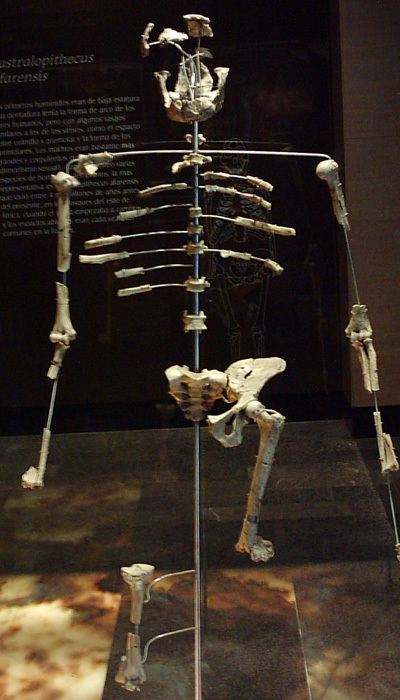 There have been about 400 specimens of Austalopithecus afarensis discovered, but the completeness of Lucy’s skeleton makes her unique. When I was taking courses in human evolution in college, it was hard for me to remember the majority of the human ancestors we studied because most fossil specimens discovered are just fragments, like parts of a skull and a few teeth, occasionaly a partial limb bone may be present. There wasn’t much for my imagination to get hold of and it was hard for me to view these weathered forms as “us”. I never had that problem with Australopithecus afarensis, though, because that species has Lucy. Studying our ancient ancestors can be hard because in the process of classifying fossil specimens as either human or non-human, we are in a way classifying ourselves. What exactly is it that makes us who we are? From the standpoint of a paleoanthropologist, who only has skeletal evidence to go on, the main differences between us and great apes are the thickness of our tooth enamel, our tall, flat foreheads, our relatively small jaws, our small canines, our brain size and our bipedalism. On the surface that may not seem like much, but when you consider the millions of years it took us to get here, it becomes apparent that tiny differences can indicate some pretty big things. Sketch of Australopithecus africanus, another member of the Australopithecus family. Author: J.M Salas. Source: Wikimedia Commons. All of this is brought home by Lucy’s skeleton. 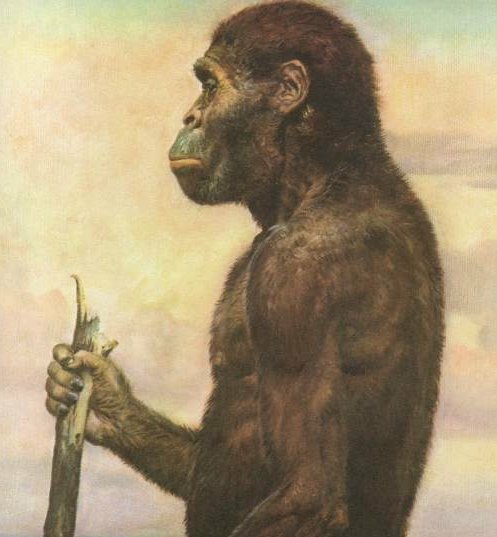 Australopithecus afarensis has many similar features to modern great apes, it has a prognathic jaw, sloping forehead, long arms, shoulders oriented for above-head movement, it is much shorter than modern humans ( males were about 5 ft. tall and females were about 3ft 5 inces tall). and it’s cranial capacity is about a third of a human’s. Human-like features include the size of the canines and the cup-like shape of the hips, the curved spines, and also bone structures in the legs and feet. Also there is the fact that the foramen magnum, where the spine connects to the skull, is at the base of the skull rather than near the back, indicating an upright, bipedal posture. There’s a mix of human and ape characteristics present in the skeleton and human-like traits that are present are still pretty archaic. If your were to examine the whole species one crumbly fragment at a time most people would be hard pressed to see anything human about it. However, when you see almost half of the skeleton in place, assembled, it becomes clear that this animal is not just another ape. The upright posture, the forward gaze, something about it is undeniably human. Or at least a step in that direction. For this reason Lucy has become a sort of mascot for paleoanthropology. 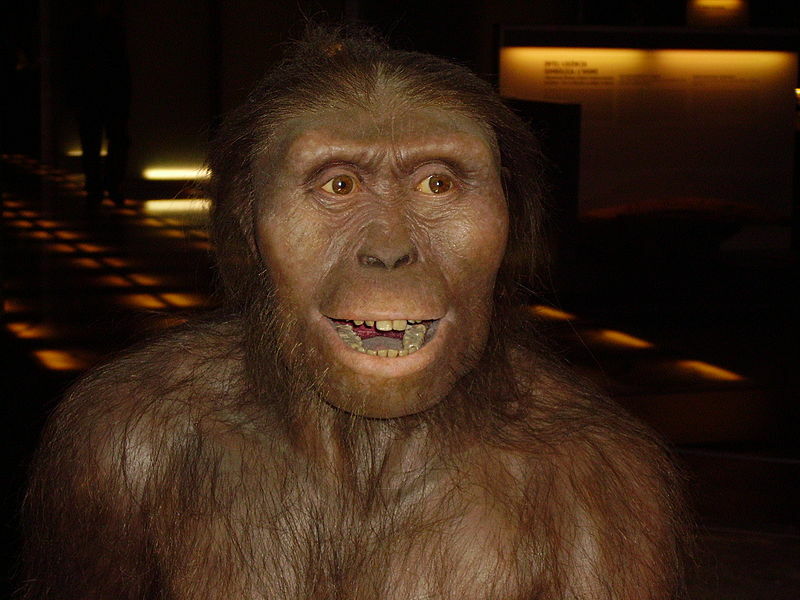 Reconstruction of Lucy (Australopithecus afarensis). Source: Wikimedia Commons. Lucy’s discovery has helped paleoanthropologists better understand Australopithecines as a whole. When it was first discovered, the exceptionally complete skeleton provided a more comprehensive look at the at a creature that very little was known about up to that point. Now a recent study has suggested that Lucy may have died after falling from a tree, leading some credence to the theory that Australopithecus afarensis lived a partially arboreal lifestyle. Lucy’s scientific importance to the field of paleoanthropology cannot be overstated. But I think that the biggest impact that Lucy had was giving a public face to a topic in science that can be pretty hard to grasp. There have been other remarkably complete fossil skeletons of human ancestors found, but none have attained the same sort of relationship with the public that Lucy has. Show a sketched recreation of what Lucy would have looked like in life, and many museum visitors would recognize it instantly. Although it is hard to put a finger on it, something about that little skeleton really grabbed the public’s imagination and in the process made a subject that can be pretty hard to grasp, and a little controversial too, more accessible. If you are interested in learning a little more about human evolution yourself, check out the fascinating course Lucy’s Legacy Revisited, taught by our curator of anthropology Dr. Drik Van Tuerenhout! The course will cover a range of topics in human evolution and is sure to bring our past to life in ways you haven’t seen before.